My name is Mandell Sam, and I played WR/FS at Opelousas High School. I am now signed to play with the University of Louisiana at Lafayette. I had 42 catches for 730 yards and 6 TDs. On defense, I had 47 tackles along with 2 INTs. Tyrann Mathieu. People have compared me to him in high school. He is a great player. LAFM: You signed with ULL. What other schools were next in line if you had to say 1-3? University of Minnesota was the next school in line. LAFM: When did you first come into contact with ULL? I went to their camp my sophomore year, and that was my first time in contact with them. They have followed me ever since. LAFM: Why did you choose the Rajun Cajuns? Like I said, it was between them and the University of Minnesota. ULL is close to home which I really liked. I wanted my family and friends to be able to watch me play. I would say going to the camps and different places. It was exciting seeing the different campuses, meeting the coaches, and the different players. LAFM: Who are some people that stand out as major factors in choosing ULL? I would say the Coaches at ULL and Coach Larry Dauterive. Coach Dauterive was my high school coach my sophomore year and then he retired. He has been someone who has always trusted me and given me advice. He gave me good advice and told me to do what is best for me. The ULL coaches always kept it real with me. They did not pressure me to commit right away, and they wanted me to weigh out all of my options. They told me to keep working hard and do not stop. They also told me that I would have to work hard to get a starting spot for their team. The coaches made sure I knew that I would have to earn a place to on their team. I liked that. It was honest and made me work harder. LAFM: What do you bring as a player to the ULL football program? I think they are getting a player who could be playing in a bigger conference. My team, no disrespect, never won many games, and we did not get much attention. I think if I had played at a John Curtis or a St. Thomas More, I would be going to a team in like the SEC. The Rajun Cajuns want me to play FS, so I would say my tackling, coverage skills, and my speed. I am excited to be on a campus and happy to be starting the college experience. I would say to stay focused and keep working hard. Do not take a day off and focus on getting better. Lastly, keep your grades up. 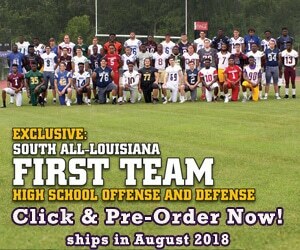 LAFM: How did Opelousas High School prepare you for playing football at the next level? At Opelousas, we played hard competition week in and week out. Good competition make you better. It definitely has prepared me to play at the next level.